Midlothian is a growing, prospering community in the southern sector of the Dallas-Fort Worth Metroplex. With a population of 34,000, a rising median income of $85,329, and a diversified skilled workforce, Midlothian is positioned as a prominent destination for businesses, both big and small. Dive into the facts that position our community for continued growth. Location is both a priority and principal benefit in Midlothian. At the crossroads of major U.S. highways and just 30 miles from DFW International Airport, Midlothian offers prime access to key markets. Discover how our community is well-suited for transportation-heavy industries. Midlothian is home to a critical mix of skilled labor, professional positions, and a well-rounded community thatâ&#x20AC;&#x2122;s filled with everything from small business owners to advanced manufacturers. With nearly 900 businesses and more than 8,000 employees, the drive for higher education breeds a local workforce that is well prepared to make something great in Midlothian. The numbers speak for themselves. Celebrating over 100 years of excellence in education, Midlothian Independent School District is the 22nd fastest-growing district in Texas. For higher education and career advancement, the Midlothian Higher Education Center offers various bachelorâ&#x20AC;&#x2122;s and masterâ&#x20AC;&#x2122;s degree programs and connects Midlothian businesses to an educated workforce. Our local leaders continue to ensure that exceptional education remains a top priority in Midlothian. Among the many reasons companies choose to locate in Texas, having no state income tax is a major draw. The assessed property taxes in Midlothian are significantly lower than many other metropolitan areas that also face health care and additional educational taxes. 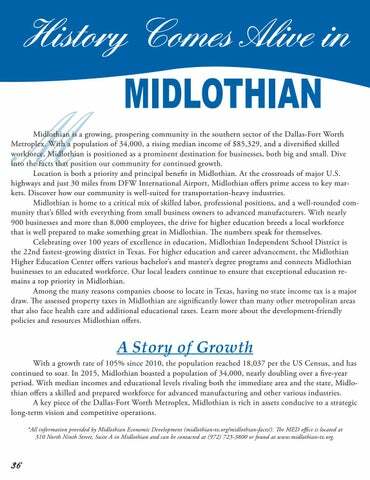 Learn more about the development-friendly policies and resources Midlothian offers. With a growth rate of 105% since 2010, the population reached 18,037 per the US Census, and has continued to soar. In 2015, Midlothian boasted a population of 34,000, nearly doubling over a five-year period. With median incomes and educational levels rivaling both the immediate area and the state, Midlothian offers a skilled and prepared workforce for advanced manufacturing and other various industries. A key piece of the Dallas-Fort Worth Metroplex, Midlothian is rich in assets conducive to a strategic long-term vision and competitive operations. *All information provided by Midlothian Economic Development (midlothian-tx.org/midlothian-facts/). The MED office is located at 310 North Ninth Street, Suite A in Midlothian and can be contacted at (972) 723-3800 or found at www.midlothian-tx.org.